Thieves aiming to steal boilers in empty properties in Salford risk getting their fingers burnt, in a new sting operation. City West has experienced a spate of boiler thefts from empty properties over the past two years. Thieves have stolen boilers from the walls of empty properties, along with associated pipework. But from this month, City West is hitting back by protecting its heating systems with an advanced electronic tagging system called Datatag. The system is designed to act as a deterrent to theft, but also to ensure that if items are taken, a City West boiler can be readily traced right across the UK. The replacement cost for the stolen boilers, together with associated damage has totalled more than £190,000. 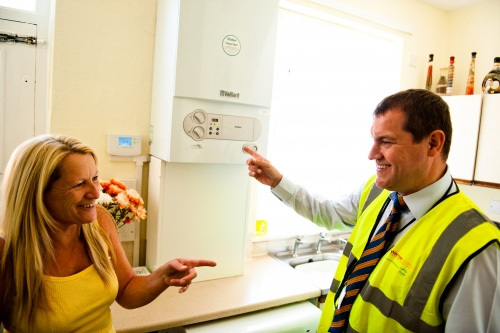 Nigel Sedman, Assistant Director of Investment and Regeneration at City West, said: “Unfortunately, boiler thefts are an increasingly common problem facing housing trusts and local authorities. As well as the cost of actually replacing the stolen goods, these thefts typically cause substantial damage to properties and delay us in renting these empty homes to people who need them. The Datatag system has been used in other parts of the country to combat boiler theft with a great deal of success. Its electronic ‘fingerprint’ ensures the police can prove when and from where equipment was stolen, and secure a conviction. Inspector Jill Gorse of the Salford West Neighbourhood Policing Team for Greater Manchester Police said: "Thieves targeting empty properties in order to steal boilers have been a persistent issue for us, and we welcome the use of this tagging system, as it will either deter criminals or make it easier to track them down." The Datatag devices will be installed on all new City West boilers, as well as being retro-fitted to boilers in vacant properties which are waiting to be re-let.